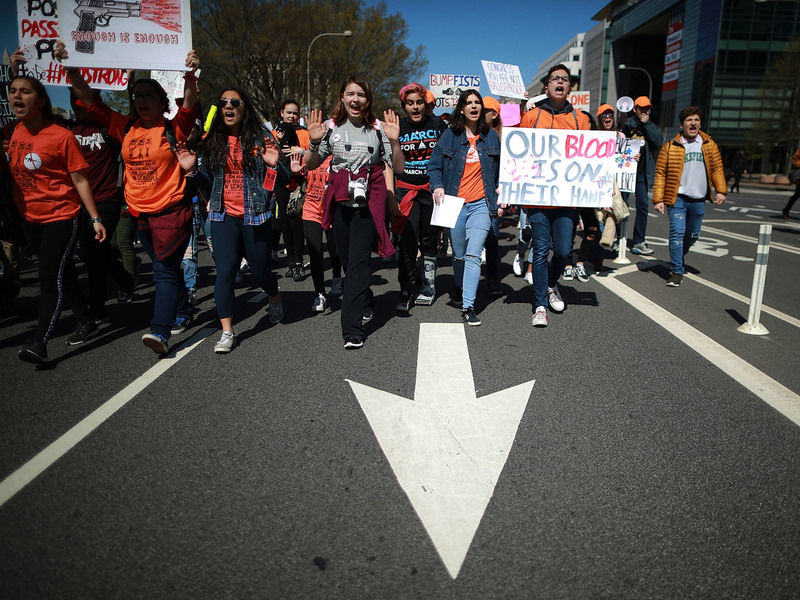 19 Years After Columbine, Students Walk Out To Stop Gun Violence : The Two-Way Some 2,600 school walkouts are planned across the country, starting at 10 a.m. in each time zone. High school students march from the White House to the U.S. Capitol to call for stricter gun laws on Friday in Washington, D.C. It's also been a little more than two months since the shooting at Marjory Stoneman Douglas High School in Parkland, Fla. The walkout begins at 10 a.m. in each time zone, and organizers said that over 2,600 walkouts were planned – at least one in each state. In some places, students faced potential disciplinary action for participating. In Washington, D.C. students gathered in front of the White House with signs. And at 10 a.m., they began the walkout with 19 minutes of silence, in remembrance of the Columbine massacre. Then, with chants against the National Rifle Association, students began marching to the U.S. Capitol. Students in New York City held a "die-in" in Washington Square Park, their bodies outlined in chalk. In Nashville, Tenn., students carried signs and marched to the city's Public Square, near that state's capitol. At Butler High School in Matthews, N.C., a suburb of Charlotte, students gathered in the bleachers. In Pittsburgh, students stood in silence in the city's Market Square. On Friday morning, Forest High School in Ocala, Fla., was placed on lockdown after a student there was shot in the ankle. Students there had been expected to take part in the walkout, but a school board member told CNN that the walkouts had been canceled district-wide after the incident. At Alpine High School in West Texas, a small group of students took part in the walkout. The school was the site of a shooting in 2016, in which a freshman girl shot another student before turning the gun on herself. Alpine students who participated in the walkout without being signed out by a parents "are facing 3 days of DAEP - a form of suspension - as well as losing National Honor Society status," reports Marfa Public Radio's Sally Beauvais.